Mr. McIntire is a 1970 graduate of Florida State University School of Music where he earned a Bachelors degree in Music Education. After graduation he enlisted in the U.S. Navy where he served for 4 years as 1st Trumpet for the Commander in Chief of the Atlantic Fleet’s ceremonial, concert and jazz bands. After discharge in 1974 he moved back to his home in Sarasota Florida where he held the position of solo cornet for the Sarasota Concert Band. During this time he played with numerous bands and ensembles including the Sarasota Choral Society, Manatee Wind Ensemble, Sarasota Brass Quintet, Ringling Bros. Circus Band (both Red and Blue shows), the circus band for the movie “The Great Walendas” as well as many solo performances with local churches and temples. 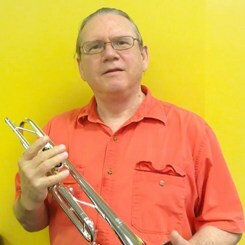 He was also an active teacher of brass instruments in the Sarasota Bradenton area teaching at the Julie Rohr Music Studios and the St. Paul’s Conservatory on Siesta Key. After moving to Nashville in 1982 he attended the Nashville School of Law and served as an assistant counsel for both the Tennessee Dept. of Commerce and Insurance and Dept. of Environment and Conservation. During this time he maintained active as a freelance trumpet player playing in several brass ensembles as well as varied solo work. He has taught brass instruments for Music and Arts since 2010. In addition he has studied Jazz at the Nashville Jazz Workshop.